So I decided to soften it up a bit with this easy shift dress from LOFT. Our relationship started about 2 weeks ago when I discovered this beauty online. Me being me, I couldn't order it online though. One, because I am not an avid online shopper. 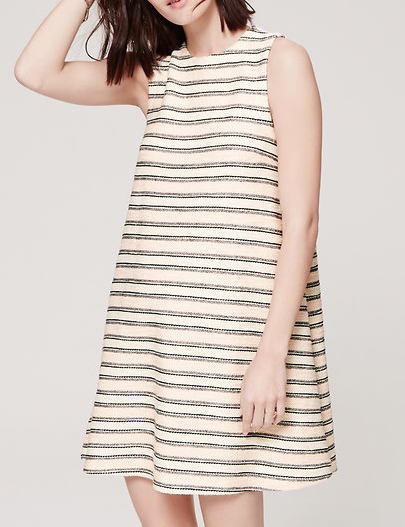 Two, I was in the middle of a rocky relationship with LOFT so I wanted to be sure I liked this dress. So there I was, stalking it online each day, checking to see if any of my local LOFT's had received it yet as it was a relatively new item that hadn't debuted in stores. But back to the rocky relationship: I had some trouble with an order weeks ago with LOFT. I was extremely disappointed with the customer service I received on the phone, so what did I do? Hit social media and expressed my concerns with LOFT. Surprisingly, they responded and sent me a special promotional discount. And once I received it, I knew exactly what I was going to use it on! So I stopped into LOFT on a day when the store was 50% off, so the original price tag of $79.50 was sliced in half that day to $39.75 (but wait..it gets better). Additionally, I was able to use my special promotion of $25 off, so I ended up walking out of LOFT with that dress for a steal! Literally. Bottom line, how businesses treat you matters. In my case, I was more than pleased with how LOFT handled it and it worked out to my advantage despite my previous frustration. Even though you might feel like you're being a pain, it's better to have a voice. Most businesses' will do what's right. Back to the outfit! 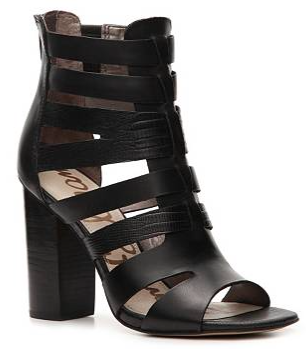 As you can see, I have become a little attached to these Sam Edelman Yazmine sandals. I still cannot get over how comfy yet how versatile they are. Now I did see that they were available in a chestnut, so I may have to put them on my birthday list since my 24th birthday is rapidly approaching! As for my bracelets, I stacked my go to Bourbon & Boweties as a fun addition to this rather simple outfit. I'm not always into outfits that are too matchy..but in this case, I liked my matching colored B&B with the colors in my dress. So when accessorizing, try to stack bracelets that you wouldn't usually wear together and you will more than likely end up pleasantly surprised. Experimenting is absolutely necessary.. at least for me! Looking for B&B? Check out my favorite shop in-store for B&B, Designed Treasures!